According to Forbes Philippines, these are the men you should invite to weddings, baptisms, and maybe even the town fiesta&mdash;otherwise known as the Richest Men in the Country! 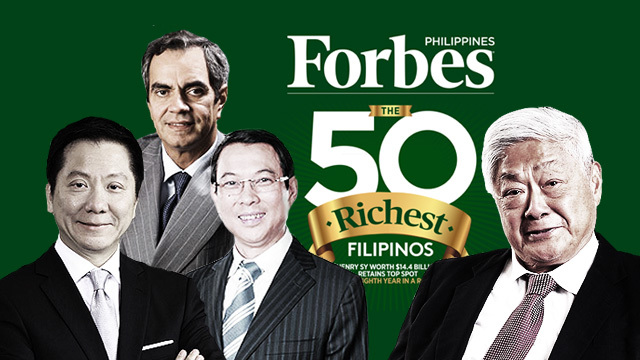 Forbes Philippines has just released what essentially doubles as the ultimate ninong list: the Top 50 Richest People in the country today. The list, which is primarily populated by local business tycoons, is focused on net wealth and was compiled based on stock prices and other relevant figures as of August 14, 2015. Those who are ardent followers of this list will see familiar names with huge swats of properties and interests across different industries. It's also notable that at least a couple of new billionaires made it to the rankings. We know you're dying to find out who to bug for your kasal or your kid's binyag are the country's richest of the rich, the people we should all emulate money-wise. Read on for those who made it to the Top 10! A self-made billionaire, Tony Tan Caktiong's fortune is the end result of having an empire filled with Yum Burgers, Jolly Hotdogs, and Chickenjoys. He's the man behind the giant construction firm DMCI which he founded in 1951. He also gets earnings from other industries including power generation and real estate. You may have heard of his family's conglomerate, Ayala Corporation, if you've been in Makati or malls like TriNoma and Market! Market! The family behind another giant conglomerate, Aboitiz Equity Ventures, which has businesses in banking, food, and property. The founder of one of the largest banks in the country, Metrobank, George Ty has also delved in other sectors such as car distribution, insurance, and real estate. He's the chairman of the country's largest port operator, International Container Terminal Services. Inc. (ICTSI), which also has a presence in Europe and Africa. A perennial member of the country's richest list, Lucio Tan has businesses in banking, property development, and beverages. He also has a stake in Philippine Airlines. He's the owner of the McDonald's franchise in the Philippines and runs the show for Alliance Global. His businesses range from food and beverages to gaming and real estate. Now you know why he's super loaded. The runner-up spot belongs to John Gokongwei, Jr., the man who heads the giant JG Summit Holdings conglomerate which has interests in the food, airlines, and telecom industries, among others. His group also owns a stake in Robinsons Retail Holdings which runs department stores, supermarkets, hardware, and other specialty stores. And for the eight-straight year, Henry Sy is the richest man in the Philippines with a net worth of over $14 billion, the only man in the country who has a double-digit billion-dollar fortune. His earnings are the result of his two huge business groups: SM Investments and SM Prime Holdings. For the full list, grab a copy of Forbes Philippines' September 2015 issue which will be available on newsstands everywhere starting September 2.